Collective movements aren't tricks. They are crucial exercises for straightening and balancing your horse. So you've gotten to Second Level dressage, and now your trainer is asking you and your horse to learn "collective movements", namely, shoulder-in and travers. At Third Level, you will train your horse to perform renvers. Why, you wonder, do we have to learn these things? Are they just fancy tricks that dressage people teach their horses? Why bother? Collective movements aren't tricks. They are crucial exercises for straightening and balancing your horse. They're pilates for your horse! Horses start life crooked (bent to one side) and carrying the majority of their weight on their forehand. To carry a rider without undue strain, the horse needs to have a strong back, carry more of his weight in his hind, and be equally strong and supple on both sides. The rider's job is to help the horse develop this strength and flexibility. To accomplish this, dressage training starts with circles, then introduces more advanced movements such as shoulder-in, travers, renvers. The horse has to bend properly through his body in order to ride these movements well. So that is what they are for--to straighten the horse's body, to make her more flexible so that she bends easily in both directions, to shift her weight back so that she carries more weight on her haunches--all of which builds a strong top line. When you ride a circle, you may have noticed that your horse bends more easily going in one direction than the other direction. That is because your horse is bent either to the right or the left, as shown in the illustration. (Photo credit: Straightness Training). Your horse's concave side has short, very strong muscles, while his convex side has long, weak, and less developed muscles. The result is that the horse will be naturally bent toward the concave side. When you ride a circle that fits your horse's natural bend, it will be easier to get him to bend through the circle. In fact, it may be too easy, as shown in the illustration. 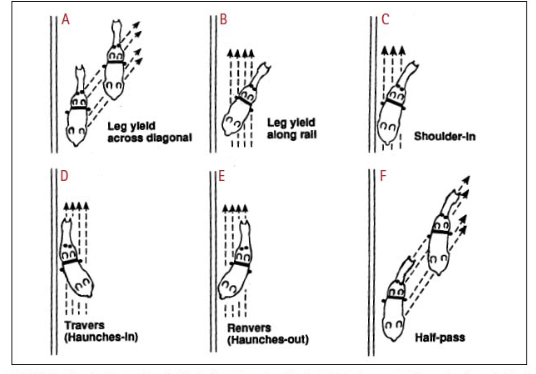 (Photo Credit: Straightness Training) If your outside rein isn't placed and used properly, your horse's outside shoulder may "pop" out too far and his haunches may swing toward the outside. As a result, the circle gets larger and larger. It will also be easier to get your horse to canter when going in this direction. When you ride a circle that is opposite to your horse's bend, it will be very difficult to get him to bend properly through the circle. Instead, he will "fall in" on the circle, and the circle will get smaller and smaller. (Photo Credit: Straightness Training) Your horse may also resist picking up the canter on his convex side. He may buck or kick out when you ask for canter. Note how these horses seem to be leaning on their front legs even though they are standing on level ground. The point of collective movements is to shift the horse's weight back toward those hind legs. This can't be done overnight; muscles take time to develop, and rushing collection can ruin your horse. 1. Perfecting the half halt. The purpose of the half halt is not slowing the horse down. It is rebalancing him by shifting his weight toward the rear. Click here to read more. 2. Perfecting leg yielding, in which the horse travels diagonally across the arena by crossing his legs. I describe it in detail here. 3. Perfecting shoulder-fore, in which the horse’s outside hind leg follows the track of the outside front leg. I describe it in detail here. 4. Introducing shoulder-in, in which the horse's inside hind leg follows the track of the outside front leg. 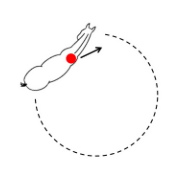 The horse's forehand is shifted toward the inside--away from the rail or toward the inside of a circle, while the hind legs stay on the rail or the circle line. Click here for more about how to ride shoulder-in. 5. Introducing travers (haunches-in), in which is the same movement as shoulder-in except that the hind legs shift to the inside while the forehand stays on the rail. Click here for more about how to ride travers. 6.Introducing renvers (haunches-out), in which the haunches stay on the track while the forelegs shift to inside and the bend is opposite to shoulder-in. Click here for more about how to ride renvers. 7. Introducing the half pass, in which the horse holds the bend developed in travers but travels diagonally across the arena. Click here for more about how to ride half pass. Here is a diagram that illustrates the differences. (Photo credit: theeventingblog.tumblr.com) Once your horse masters these, she will be straight and flexible, with a strong topline, and a balanced way of carrying herself. I hope you and your horse have fun learning these skills together. Happy riding!